CIMCO Filter drastically reduces your machining time and file size by converting multiple linear moves into arc moves, creating a much smoother toolpath. The file size can be reduced by more than 50% without any loss of accuracy with respect to the original surface. Most filtering software will simply follow the tools path. This can cause problems in zig-zag toolpaths, as the filtering causes the tool to be close to the lower tolerance limit in one direction, and close to the upper tolerance in the other direction. As can be seen in the left picture below, this causes large scallops, and a poor surface finish. CIMCO Filter eliminates this problem by detecting the zig-zag nature of the toolpath and performing the filtering calculation in the same direction on all passes. As can be seen in the right picture below, this gives a much smoother surface. Or you can get the same surface quality as with most other filtering software, with nearly half as many passes. CIMCO Filter improves the efficiency of your old controls, and allows you to fully utilize the 3D arcs and NURBS options on newer controls. CIMCO Filter replaces the linear movements (G1 in ISO code) output from the CAM system with arc moves (G2/G3 in ISO code). It is possible to set tolerance, arc type, number of decimals and minimum and maximum arc radii to match the CNC control and the desired accuracy. 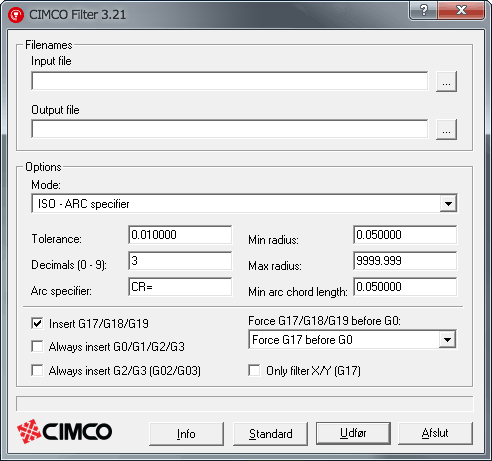 CIMCO Filter reads NC-programs in ISO and Heidenhain format and CL-data such as APT files from leading CAD/CAM manufacturers. Lines are converted into lines and arcs in the XY, XZ and YZ planes (G17,G18 and G19 in ISO code). The machining strategy applied will affect the possible reduction; if there are no moves restricted to one of the three main planes (G17, G18 and G19), no reduction will occur. One example of a program, that cannot be reduced, is a parallel toolpath, with a 30° angle to the X-axis. CIMCO Filter is used as a stand-alone program, however, it can be purchased as part of the Powercut software, which gives you rapid and accurate NC program simulation and verification based on solid technology.